The constant drumbeat of attention being paid to New Jersey Governor Chris Christie is really starting to grate. The guy says he’s not going to run. Why not take him at his word and just let him govern New Jersey until 2016? Answer: because Republicans are in a panic. They don’t trust Romney, they’re increasingly worried that Perry is unelectable, they think Bachmann is a nutcase, and the rest of their field are just fill-ins. So Christie is their once and future saviour. He yells at constituents! He killed a tunnel that liberals loved! He yells at teachers! He cut budgets! He yells at Democratic legislators! What’s not to like? Lots, it turns out, and Dan Amira finally tallies up Christie’s weak points with the Republican base in a convincing fashion. 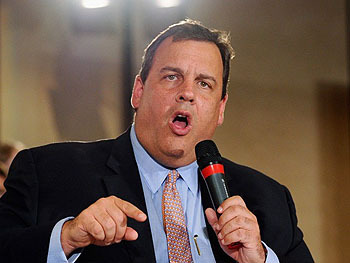 Christie does like to yell at people, but unfortunately, he likes to yell at crazy conservatives too. In particular, he’s taken very loud, very public positions on illegal immigration, gun control, climate change, education, and Sharia law that are precisely the opposite of the tea party positions. Any one of them would probably be enough to doom his chances, but five? Fuhgeddaboutit. He’d crash and burn before he even had his first chance to yell at a debate moderator for asking him a stupid question. Note to Republicans: your field is set. Your choice is between an apparently inept Rick Perry and a transparently insincere Mitt Romney. Them’s the breaks. Make the best of it.